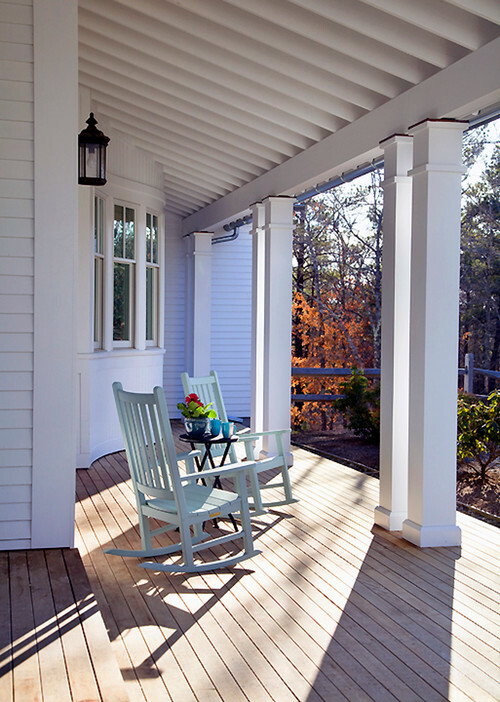 A pair of white mismatched rockers on a cabin porch beckon you to slow down and enjoy the sights and sounds of nature. 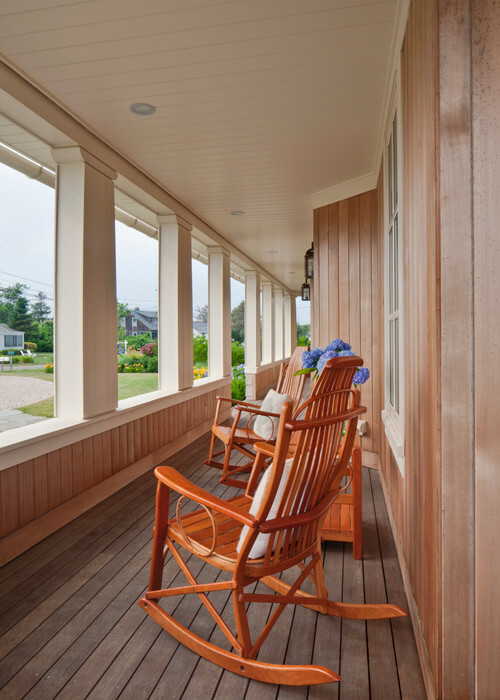 A secluded spot on the porch entices a romantic rendezvous for you and a loved one. Photo by SMOOK Architecture & Urban Design, Inc.
A pair of simple wooden rocking chairs enjoy a street-side view and makes you feel like you live in Mayberry RFD. And on a side note – what a gorgeous and healthy peace lily just behind the rockers! A second story porch feels like a tree house for adults. 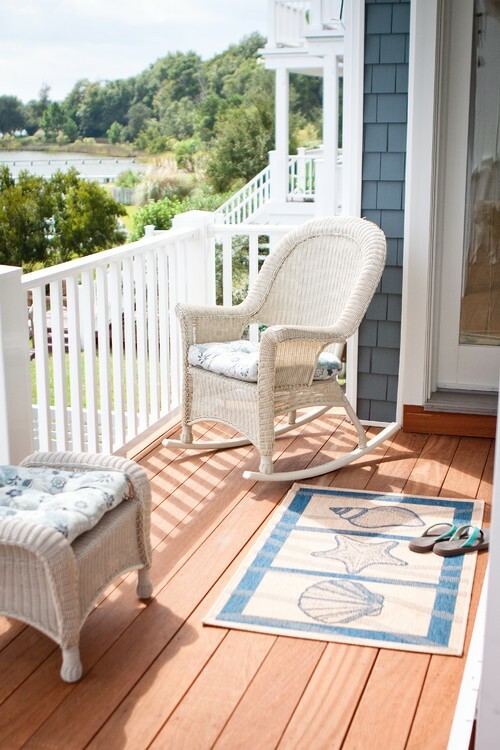 Ample wicker rockers are the perfect accoutrement to the room. 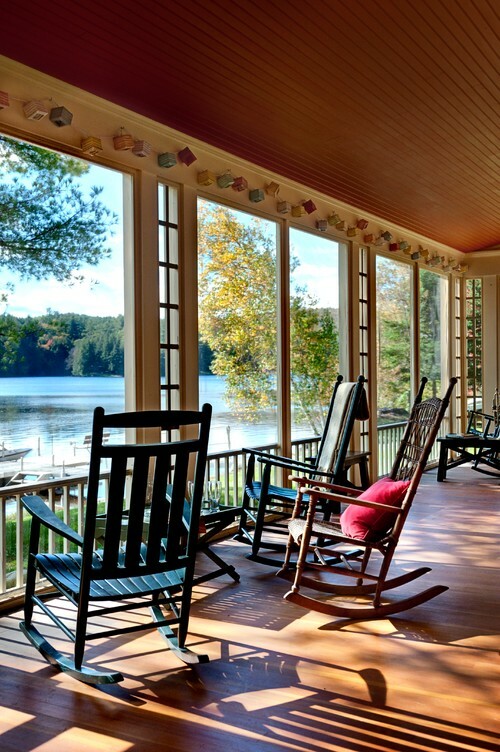 Hickory rocking chairs pair up on a balcony to take advantage of summer conversations. 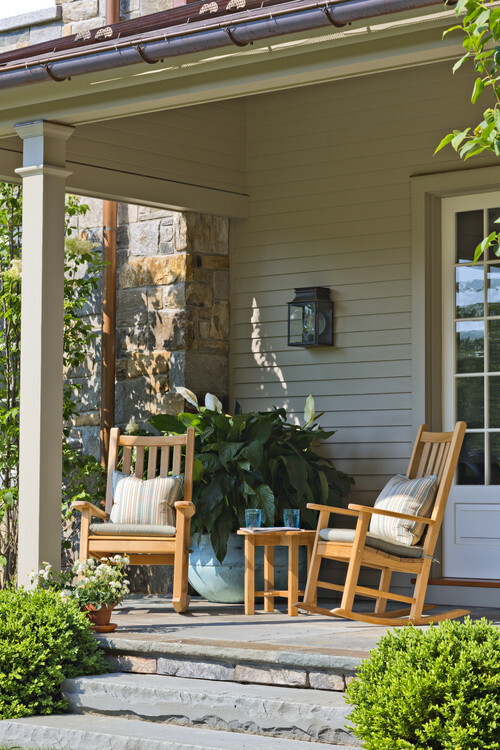 A long front porch provides space for several people to enjoy lazy summer days together. 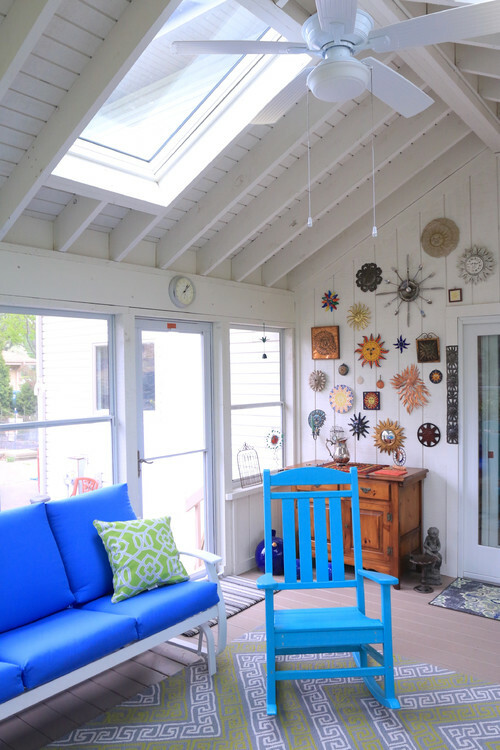 Paint a rocker a fun, bold color – to match or contrast existing porch furniture. I love this style of wicker rocking chair. It would look equally pretty inside the house as it does outside. Before I even looked to see where this photo was taken, I knew it had to be somewhere in the low country. Sure enough, it’s a scene from Beaufort, South Carolina that I’ve had the pleasure of visiting more than once. 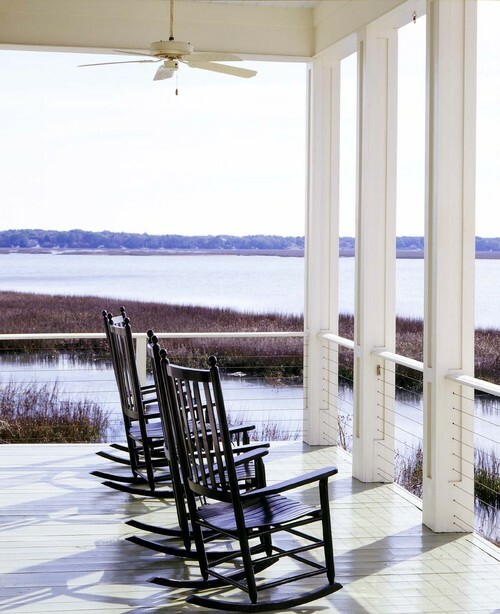 The slat board rocking chairs are an iconic Southern classic. I rocked my oldest daughter to sleep on many nights in a white wicker rocking chair just like this one. Her chair was in a corner of her yellow nursery as opposed to the front sun porch in our little bungalow home. 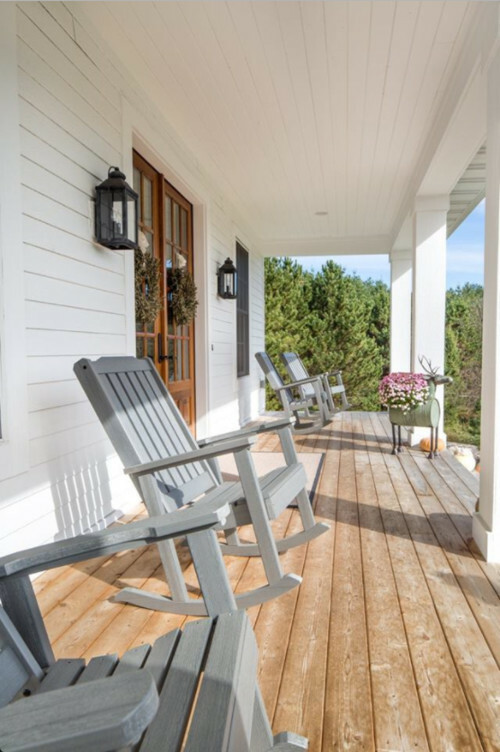 Rocking chairs on the porch don’t have to match. 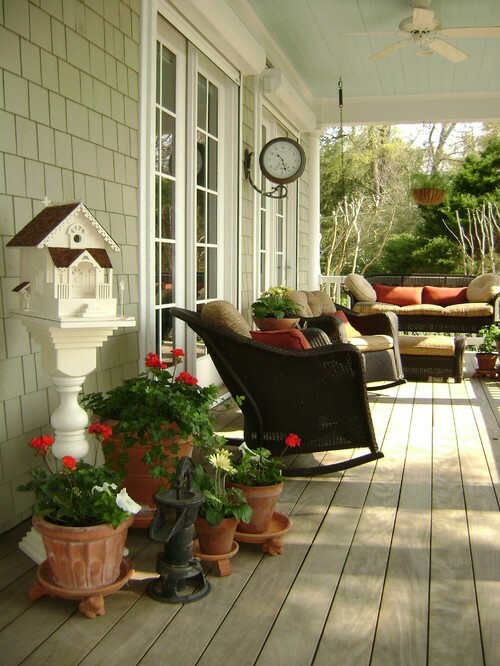 An eclectic mix can be charming and appealing. 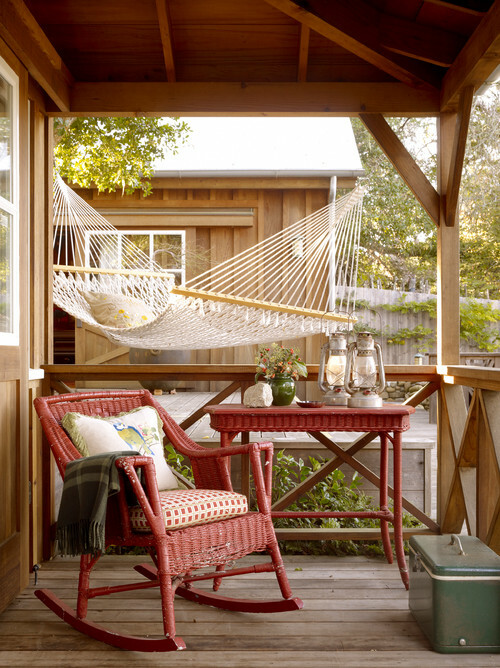 A pair of red rockers beckon you to shirk your chores and enjoy the summer breezes. What type of rocking chair is your favorite? It’s hard to beat the hickory rocker for style AND comfort! 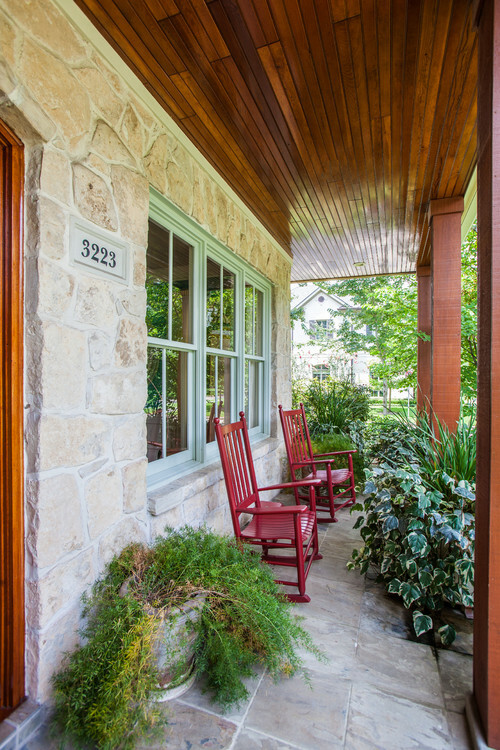 Porches are a wonderful place to sit and watch the world go by! We recently moved to a new home and state, now in Flagstaff, AZ. 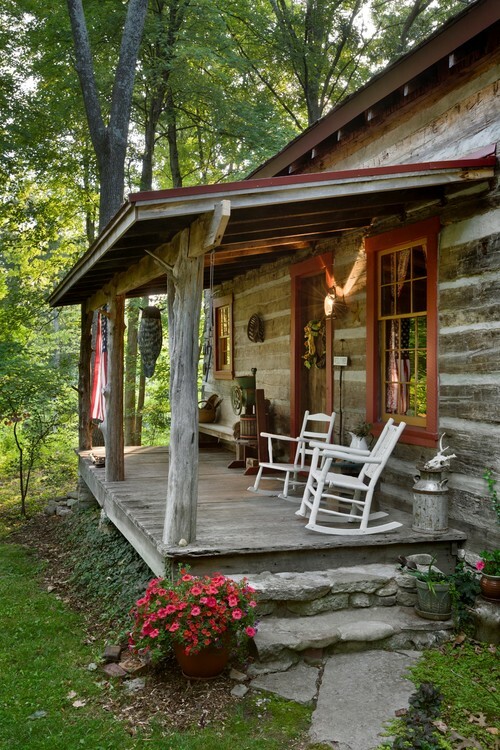 One thing on my list of must haves was a front porch. Just finished repainting a wooden bench that was left with the house. Now I need to make a couple of pillows to add to the relaxing atmosphere! I would love a covered porch, but living in an A-Frame house you get nothing but decks… but we do have a covered pool deck so that helps some but it’s still not the same…One day maybe. Ahhh, I’d love to be rocking one of my grand babies in a sturdy, cushioned,wicker rocker looking out over a lake, or the beach. Right now. I have a screened porch on front and i need a rocker bad, that is on my list along with a ceiling fan, it’s my favorite place to sit. I like my back porch it’s a good size but right now i have babies and their mom goes crazy when i sit back there, birds they are so funny.